It just rained intensively for about 20 minutes, then stopped. I wish it would last as a drizzle for 3+ days. 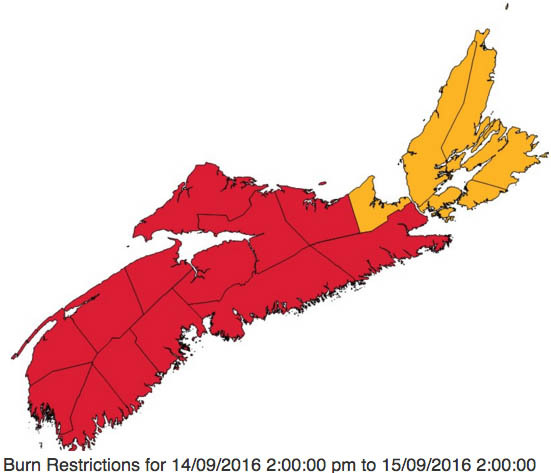 We expect fires in the spring in Nova Scotia, but large fires have been rare in the fall. Typically, spring fires burn only a few millimeters into the the soil. It’s the above ground vegetation that provides the fuel, before the deciduous trees leaf out and reduce flammability. After a prolonged drought, the soil can be bone dry through a large part of the organic and root-rich surface horizons. When the roots and organic matter in those horizons catch fire, the fire is both more difficult to control and much more damaging than when just the surface of the soil burns. Such was case with the Keji-area fire in August. Camp fire on Jack Pine barrens on Halifax south mainland: not smart anytime! Of course we have the advantage today of sophisticated monitoring and rapid response, and I have a lot of confidence of NSDNR in this regard. But we all need to be cognizant of the situation and stay out of the woods when so advised by NSDNR, however difficult that may be. This entry was posted in Climate Change, Fire, NSDNR. Bookmark the permalink.